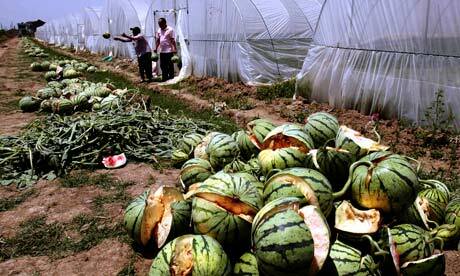 The Green Sanctuary: What causes Watermelons to explode in China ? What causes Watermelons to explode in China ? New food scandal as fields of watermelons are destroyed after farmers mistakenly apply growth accelerator. Fields of watermelons exploded when he and other agricultural workers in eastern China mistakenly applied forchlorfenuron, a growth accelerator. The incident has become a focus of a Chinese media drive to expose the lax farming practices, shortcuts and excessive use of fertiliser behind a rash of food safety scandals. It follows discoveries of the heavy metal cadmium in rice, toxic melamine in milk, arsenic in soy sauce, bleach in mushrooms, and the detergent borax in pork, added to make it resemble beef. Compared to such cases of dangerous contamination, Liu's transgression was minor, but it has gained notoriety after being picked up by the state broadcaster, CCTV. The broadcaster blamed the bursting of the fruit on the legal chemical forchlorfenuron, which stimulates cell separation but often leaves melons misshapen and turns the seeds white. The report said the farmers sprayed the fruit too late in the season and during wet conditions, which caused the melons to explode like "landmines". After losing three hectares (eight acres), Liu said he was unable to sleep because he could not shake the image of the fruit bursting. "On 7 May, I came out and counted 80 [burst watermelons] but by the afternoon it was 100," he said. "Two days later I didn't bother to count any more." About 20 farmers and 45 hectares around Danyang were affected. The fruit could not be sold and was instead fed to fish and pigs. Farmers claim forchlorfenuron can bring the harvest forward by two weeks and increase the size and price of the fruit by more than 20%. Agricultural experts say forchlorfenuron has been widely used in China since the 1980s. Some said it was unsuitable for this fruit, but there was probably little health risk. "In general we don't suggest chemicals with plant hormones be used on watermelons, as they are very sensitive. They might end up looking very strange and people will not want to buy them," said Cui Jian, director of the vegetable research institute at Qingdao Academy of Agricultural Science. "The taste won't be as good and storage is more difficult, but it should not harm anyone's health." Environment groups say the overuse of agricultural chemicals is a problem that goes beyond growth stimulants. Pan Jing of Greenpeace said farmers depended on fertilisers because many doubled as migrant workers and had less time for their crops. This dependency was promoted by state subsidies keeping fertilisers cheap. "The government is aware of the environmental problems caused by chemical fertiliser, but they are also concerned about food output." Many farmers grow their own food separately from the chemically-raised crops they sell. "I feel there is nothing safe I can eat now because people are in too much of a hurry to make money," said Huang Zhanliang, a farmer in Hebei. Concerns about food safety have lingered despite government promises to deal with the problem after six babies died and thousands became ill because of melamine-tainted milk in 2008. The authorities appear to have mixed feelings about the role of the media and public opinion in naming and shaming culprits. In the wake of the melamine scandal, police jailed one of the parents, Zhao Lianhai, who had set up a website to expose the problem and appeal for justice. Recently, however, officials have encouraged coverage of food safety issues. Zhang Yong, head of a new cabinet-level food safety commission, praised the media's "important watchdog role". In the past week, the People's Daily website has run stories of human birth control chemicals being used on cucumber plants in Xian, China Daily has reported Sichuan peppers releasing red dye in water, and the Sina news portal revealed that barite powder had been injected into chickens in Guizhou to increase their weight. More alarming still was a study by researchers at Nanjing Agricultural University that estimated a tenth of China's rice may be tainted with the cadmium, a heavy metal that can affect the nervous system. This caused a stir when it was published earlier this year in the pioneering Caixin magazine. Many wary consumers choose to buy foreign products, which are seen as safer. But this is also vulnerable to mislabelling. The Fruit Industry Association of Guangdong province told reporters this week that "most 'imported' fruit are grown in China".